Water for London is supplied from groundwater sources and a reservoir system filled from the Thames and Lee rivers. Upstream of London these river basins are fed by catchments and chalk and limestone aquifers that also supply local demands. London, which has by far the largest daily water use in the system, comprises a distributed demand fed from the reservoirs through water treatment works by a complex supply network allowing different parts of the city to receive water from multiple sources. The Aquator model for this system is split into two parts: London sub model and Thames, i.e. all components upstream of London. The complete model of over 1400 components can be run as a whole or the London sub model can be run separately with catchment flows applied to the Thames and Lee rivers just upstream of London. This enables the modeller to test scenarios for London more rapidly, as the model run time for London with about 400 components is considerably faster than the complete model. Another interesting feature of this model is the development of special Aquator components for the client, Thames Water, which simulate the company operating rules for chalk and limestone aquifers, surface water inflows and strategic supplies. The client, Canal & River Trust, needed a flexible software platform to build water resource models of the 2000 miles of canal network in England and Wales. The principal difference between a canal network model and a utility supply network model is that there are no urban demand centres for sources to demand water. For these Aquator models we use a standard reservoir component to emulate a canal pound coupled with the river regulation function to control the movement of water. 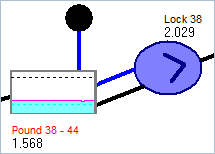 As the operation of a lock on a canal requires a number of complicated rules that are difficult to implement with a standard Aquator component, we developed a special Aquator Lock component that emulates lock operation in a canal system for the client. Further details can be found in this document. In Northern Spain in the early 20th century, Bilbao and Vitoria had independent supply systems based on groundwater springs and reservoirs. In 1934, the government approved a project for transferring water from the headwaters of the Zadorra basin to the North. The Zadorra system would support population growth for Bilbao, providing cheap energy and enough water for developing heavy industry located in the city. During the 70s and 80s, the Zadorra system supported large population growth in Bilbao and Vitoria and the water resources were thought to be enough to guarantee both urban demand and hydropower generation, which had priority over urban supply during large parts of the year, when the stored volume exceeded a control curve. Unfortunately the sharing of resources was suddenly interrupted during 1989-91, when the system suffered the most severe drought ever registered, leading to cuts in hydropower generation. 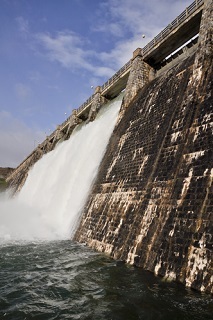 The resulting reduction of hydropower transfers and the subsequent indirect reduction of flood control capacity led to severe flooding in 2003, causing large economic losses. 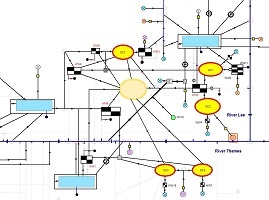 In 2006 SENER, who was contracted by the regional government, built an Aquator model of the system to investigate how to operate and develop the Zadorra system to prevent future failures and allow for further growth. The subsequent results and recommendations were accepted by all parties, leading to the resolution of an 18-year 'water war'.